Vacuoles are membrane-bound compartments within some eukaryotic cells that serve a variety of secretory, excretory, and storage functions. These organelles are found in the cytoplasm of most plant cells and some animal cells. In protists, vacuoles function in food and water storage and contractile vacuoles play a role in osmoregulation. Vacuoles and their contents are considered to be distinct from the cytoplasm, and are classified as ergastic (non-protoplasm material) according to some authors (Esau 1965). Vacuoles are especially conspicuous in most plant cells, where they can occupy up to ninety percent of the cell volume and function in filling space (Alberts et al. 1989). Organelles, such as the vacuole, are part of the harmony seen in the natural world, whereby entities provide a function for the larger entity of which they are part. Just as the vacuole provides a function for the cell, the cell provides a function for an organism (via tissues, organs, and organ systems), and organisms contribute to the ecosystem of which they are part. Vacuoles also play a major role in autophagy (degradation of a cell's own components), maintaining a balance between biogenesis (production) and degradation (or turnover), of many substances and cell structures. Vacuoles store food and other materials needed by a cell. They also aid in destruction of invading bacteria or of misfolded proteins that have begun to build up within the cell. The vacuole is a major part in the plant and animal cell. In macroautophagy, there is sequestration of organelles and long-lived proteins in a double-membrane vesicle called an autophagic vacuole (AV). The outer membrane of the autophagic vacuole (or autophagosome) fuses in the cytoplasm with a lysosome to form an autolysosome or autophagolysosome, where their contents are degraded via acidic lysosomal hydrolases (Rubinsztein et al. 2005). 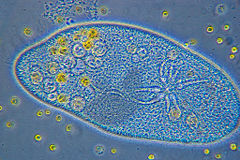 Figure 1: A paramecium. The contractile vacuole can be seen as the multiple 'armed' structure on the right-hand side of the ciliate. A contractile vacuole is a sub-cellular structure involved in osmoregulation. It pumps excess water out of a cell and is found prominently in freshwater protists. Basically, the contractile vacuole stores extra water. If the cell has a need for water, the contractile vacuole can release more water into the cell. But if water is in excess, the contractile vacuole will remove it. Some protists and macrophages use food vacuoles as a stage in phagocytosis—the intake of large molecules, particles, or even other cells, by the cell for digestion. They are also called "storage sacs." A contractile vacuole is used to pump excess water out of the cell to reduce osmotic pressure and keep the cell from bursting, which is referred to as cytolysis or osmotic lysis. In Paramecium, a common freshwater protist, the vacuole is surrounded by several canals, which absorb water by osmosis from the cytoplasm. After the canals fill with water, the water is pumped into the vacuole. When the vacuole is full, it expels the water through a pore in the cytoplasm, which can be opened and closed. Other protists, such as Amoeba, have contractile vacuoles that move to the surface of the cell when full and undergo exocytosis. Contractile vacuoles are often used as a cell's method of propulsion. In budding yeast cells, vacuoles act as storage compartments of amino acids and detoxification compartments. Under conditions of starvation, proteins are degraded in vacuoles in a process known as autophagy. 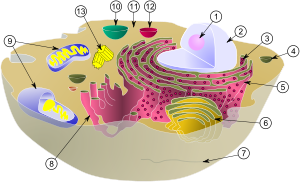 First, cytoplasms, mitochondrion, and small organelles are covered with multiplex plasma membranes called autophagosomes. Next, the autophagosomes fuse the vacuoles. Finally, the cytoplasms and the organelles are degraded. In a vacuole of budding yeast, black particles sometimes appear, called a dancing body. The dancing body moves actively in the vacuole and appears and disappears within ten minutes to several hours. In previous research, it was suggested but not proven that the main component of the dancing body is polyphosphate acid. It is believed that the main component is crystallized sodium polyphosphate and its function is thought to be to supply and store phosphates in budding yeast cells. Most mature plant cells have one or several vacuoles that typically occupy more than 30 percent of the cell's volume, and that can occupy as much as 90 percent of the volume for certain cell types and conditions (Alberts et al. 2002). A vacuole is surrounded by a membrane called the tonoplast. This vacuole houses large amounts of a liquid called cell sap, composed of water, enzymes, inorganic ions (like K+ and Cl-), salts (such as calcium), and other substances, including toxic byproducts removed from the cytosol to avoid interference with metabolism. Toxins present in the vacuole may also help to protect some plants from predators. Transport of protons from cytosol to vacuole aids in keeping cytoplasmic pH stable, while making the vacuolar interior more acidic, allowing degradative enzymes to act. Although having a large central vacuole is the most common case, the size and number of vacuoles may vary in different tissues and stages of development. Cells of the vascular cambium, for example, have many small vacuoles in winter, and one large one in summer. Aside from storage, the main role of the central vacuole is to maintain turgor pressure against the cell wall. Proteins found in the tonoplast control the flow of water into and out of the vacuole through active transport, pumping potassium (K+) ions into and out of the vacuolar interior. Due to osmosis, water will diffuse into the vacuole, placing pressure on the cell wall. If water loss leads to a significant decline in turgor pressure, the cell will plasmolyse. Turgor pressure exerted by vacuoles is also helpful for cellular elongation: as the cell wall is partially degraded by the action of auxins, the less rigid wall is expanded by the pressure coming from within the vacuole. Vacuoles can help some plant cells to reach considerable size. Another function of a central vacuole is that it pushes all contents of the cell's cytoplasm against the cellular membrane, and thus keeps the chloroplasts closer to light. The vacuole also stores the pigments in flowers and fruits. Vacuoles in animals are a part of the processes of exocytosis and endocytosis. Exocytosis is the extrusion process by which a cell directs secretory vesicles out of the cell. Proteins from the Golgi apparatus initially enter secretory granules, where processing of prohormones to the mature hormones occurs before exocytosis. Exocytosis also allows the animal cell to rid waste products from the cell. Endocytosis is the reverse of exocytosis. There are various types. Phagocytosis ("cell eating") is the process by which bacteria, dead tissue, or other bits of material visible under the microscope are engulfed by cells. The material makes contact with the cell membrane, which then invaginates. The invagination is pinched off, leaving the engulfed material in the membrane-enclosed vacuole and the cell membrane intact. Pinocytosis ("cell drinking") is essentially the same process, the difference being that the substances ingested are in solution and not visible under the microscope (Ganong 2003). Hydropic (vacuolar) changes are of importance of identifying various pathologies, such as the reversible cell swelling in renal tubules caused by hypoperfusion of the kidneys during open heart surgery. Esau, K. 1965. Plant Anatomy, 2nd edition. John Wiley & Sons. Ganong, W. F. 2003. Review of Medical Physiology, 21st edition. New York: McGraw-Hill. ISBN 0071402365. McPhee, S. J., V. R. Lingappa, and W. F. Ganong. 2003. Pathophysiology of Disease: An Introduction to Clinical Medicine. New York: Lange Medical Books/McGraw-Hill. ISBN 0071387641. Rubinsztein, D. C., M. DiFiglia, N. Heintz, R. A. Nixon, Z. H. Qin, B. Ravikumar, L. Stefanis, and A. Tolkovsky. 2005. Autophagy and its possible roles in nervous system diseases, damage and repair Autophagy 1(1): 11-22. PMID 16874055. Retrieved July 5, 2008. This page was last modified on 25 October 2016, at 20:38.